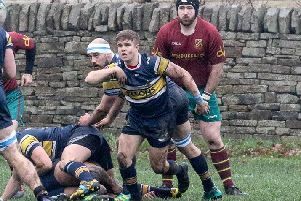 Brighouse Rangers’ long unbeaten run finally came to an end when they were beaten 24-22 at home to East Hull in the quarter final of the 40/20 Yorkshire Men’s League knockout cup on Saturday. However, they did not go down without a fight, losing in controversial circumstances. East Hull, who finished third in last season’s Premier Division, opened strongly. Uncharacteristic defensive lapses by Rangers in the middle allowed the visiting forwards to gain ground on several occasions. Quality ball movement resulted in two quick tries out wide and flawless goal kicking enabled the visitors to establish a 12-0 lead in as many minutes. If the visitors thought that was the game won, they were much mistaken. Rangers got a toehold in the game when Jordan Sild crashed over the try line in the 19th minute, too wide out for Jamie Barraclough to convert, but Rangers were beginning to re-establish a bit of self-belief. East Hull were becoming indisciplined under a bit of pressure, and were reduced to 12 men for persistently being offside after a team warning. Rangers laid siege to Hull’s line for much of the remainder of the half. Veteran Gavin Midgley had a try chalked off for Rangers, but ball handling errors and dogged defending by the visitors meant the score line at the break was 12-4 against Rangers. Five minutes into the second half, East Hull scored in the right corner to extend their lead to 16-4. Inexplicably, the conversion attempt which appeared wide and short, was deemed successful by the referee, much to the disbelief of the players, crowd, and the goal kicker himself, who was in the process of chastising himself when the referee’s arm went in the air. Rangers’ forwards, with Lee Robson, the Bailey brothers and Cameron Duffy prominent, were starting to punch holes in East Hull’s previously tight defence, and Will Clerehugh’s shrewd acting half back distribution led to Rangers getting on the front foot. A flowing move gave Andrew Esmond a one on one with his lumbering opponent, who was easily stepped, and Barraclough’s conversion brought the score to 18-10. Rangers were playing much better rugby at this stage, youngsters Lucas Birts and Tom Oldroyd showing no fear against substantially bigger opponents. 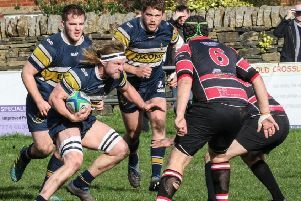 Against the run of play, a defensive lapse from a scrum allowed the visitors to extend their lead to 24-10 on 65 minutes with a long range try in the corner. It was again converted but plucky Rangers weren’t done yet. Esmond scored again for Rangers with 10 minutes to go, choosing to run over an opponent this time, again converted by Barraclough, making the score 16-24. Gamesmanship from the East Hull skipper, who seemed to need every decision explaining to him, did little to stop the Rangers onslaught. Oldroyd was halted inches from the line and winger Lewis Taylor bundled into the flag on the line as Rangers tried to get over the line again, but credit must go to East Hull’s scrambling defence. They were powerless, though, to stop a rampaging Sild smashing through the middle to score under the posts, but it was too late for Rangers to regain the ball after Barrraclough’s conversion, the referee blowing for time. Coach Glenn Barraclough, though not happy with the result, was extremely proud of his players’ tenacity and performance against a team from the higher division, and refused to dwell on the fact the game might have finished a draw, preferring to focus on the future league campaign.